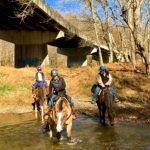 So you want to go trail riding…. Good! I encourage you to. I happen to think it is one of the most fun things to do in the world. But, a little bit of planning and thought, will make the experience more fun and safe for you, and more importantly, your horse. Know where you are going. That seems simple, right? Map Quest, directions off the site, or plotting on a road map will get you to the trails. But planning where to go, involves so many other facets. Do you know the trails? If not, you will need a map. Often park trails connect to trails on private land. Without a map you could inadvertently trespass. Or get lost, or take a hikers only trail and get stuck on the side on a mountain with no way to turn around. The mind boggles at the number of things that could happen. It also helps if you can read a map, but that is another discussion. On the TROT website we have a Trail Directory, listings of all the parks with maps. Very handy! 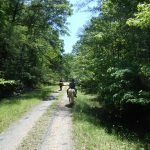 Is this trail appropriate for you and your horse’s level of condition and experience? Are you ready for 10-15 miles of hills and rocks? Is your horse? If you have never ridden more than an hour in the ring, neither you nor your horse is ready for the outback yet. Start with one of the smaller beginner friendly parks, such as Schooley Mill, Rosaryville, Little Bennett, and Morgan Run (in MD). In these parks you are never more than 30 min. from the trailer. If you ride for an hour or so, and feel you both can go on, you can ride another loop, or take another trail. 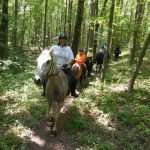 Check the TROT website listings, or the Park’s official page for descriptions of the park trails. Do you have appropriate preparation? Shoes, insect repellent, etc. Walking back to the trailer because your horse is footsore from the rocks is not fun. Nor is riding a horse constantly fretting and fighting flies. 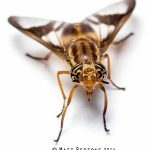 Especially these Delta Wings of Death (aka Deerflies) Horse ears are a special delicacy for them, but they will sample riders as well. 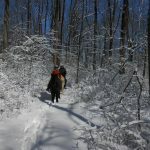 Have you checked the trail conditions? 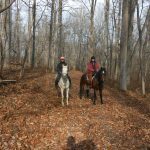 If it has rained recently, and you are thinking of lowland trails, you may be facing knee deep mud (and the possibility of trail damage if you ride) If there has been a storm, there may be downed trees. If there is a river to cross, think not only of how much rain we have had, but also upstream from the park. Rivers in flood are not safe to cross, not just because of the current and water depth, but also hazards swept down stream by the water, sharp metal, tires, etc. Often you can call the park and check on conditions, but usually it is left to your own judgment. The TROT Facebook page is an excellent resource also, but if there is any doubt about conditions, don’t ride! It’s not worth risking yourself and your horse. An excellent option when the footing is muddy is the Patuxent Wildlife Research Center North Tract. The trails there are dirt roads designed for tanks. The footing is always good, and you will not damage sensitive trails riding when conditions are wet. Always be a responsible trail steward. Riding our wonderful trails is a privilege, which we can quickly lose if we damage sensitive ecosystems by riding when the trails are too wet. Ok, so you have decided on the place, you are ready to go, but before you leave the barn pick up some essentials. First, bring water. Many horses will not drink water from streams, and you shouldn’t count on there being good drinking water available. Bring water from home (rinsed out cat litter containers work great!) and a bucket! Bring extra. You never know how much they will want to drink, and you may want to rinse them off after the ride, or have an injury to clean out, etc. Bring water for yourself, even in winter you can get dehydrated. Bring fly spray. doesn’t matter where you ride, you will need it. I would suggest spraying it on yourself as well, flies and ticks aren’t picky. I also bring fly bonnets for the ears, and soak them with fly spray before putting them on. Nothing more miserable for your horse than flies biting their ears. Bring sunblock! Even in winter you can and will get sunburn. Make sure you have all your tack, and it is appropriate. You may want a thicker saddle blanket, to reduce the chance of sores. Does your saddle slip easily? think about a breast collar. No fun trotting up a hill and sliding back to your horses tail. Bring extras, just in case. Extra halter, lead line, bridle. Things can break at the worst time. Bring a first aid kit, for human and horse. Bring a muck bucket and fork. You should never clean out your trailer in a parking lot. Bring bribes. Apples, carrots, grain, whatever. You may have to catch a horse that just broke that ‘unbreakable’ lead line, or convince your horse to get in the trailer to go home, etc. Don’t forget tail ribbons for appropriate personalities, red for horses that kick, yellow for stallions, green for greenies who are new to the trail. Most importantly, bring your sense of humor and adventure! Well, almost…there are still some rules of engagement to consider. Trailering – be considerate of your horse and other drivers. Take corners smoothly, and don’t accelerate until the trailer is straight behind you. Accelerating through a turn is like playing ‘Crack the whip’ with your horses. They can lose their balance and slip or fall. Give yourself extra time to stop. hitting the brakes suddenly can also throw your horse off balance. Don’t follow too closely, and give other drivers plenty of notice if you change lanes. For practice, put a bucket of water in your trailer, and drive your usual route. If you don’t spill any water, you are doing it right. Or attend one of the wonderful trailing clinics TROT and other horse organizations put on. It will be an eye opener! Parking – Again, be considerate. Give yourself room to tie your horses, and drive away at the end of the ride. Give everyone else the same consideration. There is nothing worse than getting to a great trail location to find out someone with their big rig has parked across the parking lot blocking everyone else from getting in (or out!). Trash Patrol – Always pick up your trash, left over hay, manure, everything! Many areas are sensitive environments, and fellow park users are certainly sensitive to road apples left in parking lots. Be an Ambassador – If you are in a public park, someone will come up to admire your horse. Take a moment to talk to them, let them pet your horse if it is ok. Take the opportunity to teach them a bit about horses, and make it a positive experience. Everyday we lose more places to ride. It doesn’t take much for parks to decide they don’t want horses there any more. Never let them ride – Kids always ask, it’s not a good idea. The liability issues boggle the mind. Let them know about a local barn with lessons instead. Ok, you are tacked up, everything is put away in your trailer. You have done 20 questions with the kiddies and their parents have dragged them away. Now you are ready to go. But wait, who’s in charge here? It’s best to decide who will lead the ride (preferably the one with the map). Who will be drag? No, not A Drag, but the ‘Drag rider’, the person who rides last in the group, making sure no one gets left behind. You can trade off positions as the ride progresses, to give everyone the experience of both. So now you gallop off down the trail, right? Not such a good idea. You are still in the parking lot area, with lots of people, other horses, etc. If your group goes charging off, the other horses may spook or kids may dart in front of you and get run over. It’s always better to walk your horse the first 15-20 minutes to warm them up anyway. So mosey quietly out of the staging area and out on the trails. 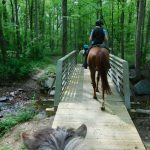 While on the trails, remember Trail Etiquette Be polite to other trail users, but also be prepared for them to not understand horses. Don’t hesitate to call out if someone has a loose or barking dog, but be sure to thank them after they have caught Cujo and restrained him. Let safety determine your speed, and always remember to ask the group if they are ready before a change in speed. Nothing more alarming than taking your feet out of the stirrups to stretch just as the person in front of you decides to work on racing departs. Call out to the riders behind you if you spot any trail hazards, such as low branches, holes, glass, etc. If you are leading the ride, remember the pace (and difficulty) of the ride is determined by the lowest level horse and/or rider. If you have a ‘white knuckle’ rider, you aren’t going to be galloping the trails that day leaping every tree and deadfall you find. If you have a green horse along, probably not the day to explore the cliffs and slides along the river. Keep track of your group, and make sure no one is left too far behind. When you get to an obstacle, such as a log or water crossing, stop, give everyone a chance to catch up, then slowly cross. After you have crossed, move on so the next horse has room, but do it at a slow walk so the following horses don’t suddenly think they are being left behind. Always wait until the last horse is clear of an obstacle before speeding up the gait. Any horse can feel abandoned on a ride, and rush to catch up. That’s when horses slip, get caught, etc. and riders come off. A little common courtesy prevents a lot of possible problems.